Fine art floor mats by renowned artist Jason Mathias. These beautiful welcome aboard mats are sure to dress up your yacht or boat, making for a unique personalized and customized presentation. 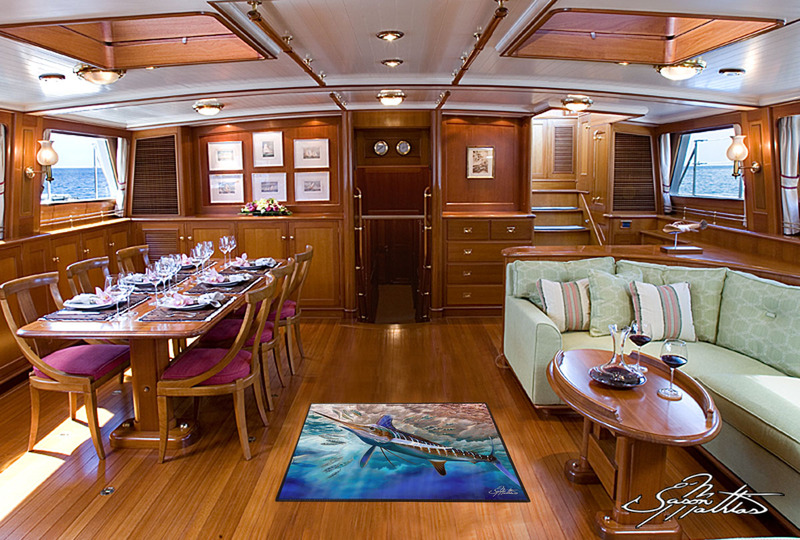 Whether you're selling yachts at a boat show or just wanting a custom mat with your boats name on it these fine art mats are perfect for you! Mats should not be placed into a cloths washer or dryer. They should be washed using a scrub brush and BLEACH FREE laundry detergent, rinsed and lined dried. We recommend spray on carpet cleaner used according to the directions on the can. You can safely hose off the mats as you wish. Mats should not be left out in direct sunlight as the art will fade. ALL FLOOR MATS ARE MADE TO ORDER AND SHIPPED USING USPS. DELIVERY TAKES 2 WEEKS OR LESS FROM THE TIME OF YOUR ORDER.